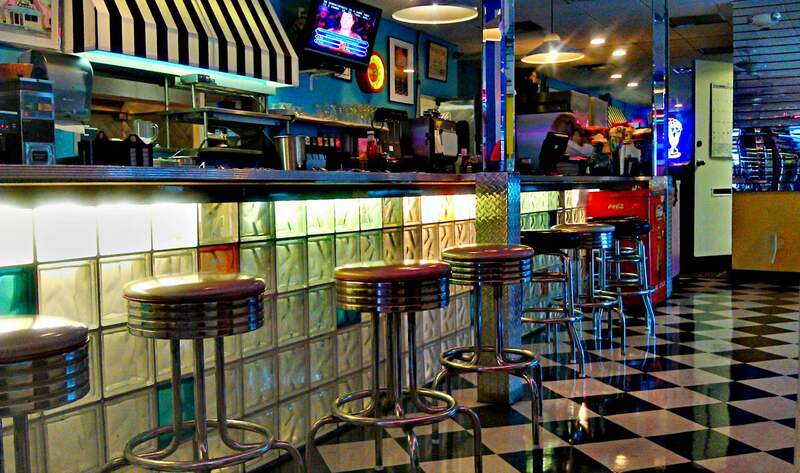 This entry was posted in Family, Florida -- General, Food, Photography and tagged Delray Beach, Diner, Ellie's 50's Diner, Family, fifties nostalgia, Florida -- General, Food, Photography on February 19, 2012 by Bill. I love the block glass and the lighting. We used to have a place called “Mels Diner” in Bradenton that had old car shows and stuff….they went out of business and I can’t see how by the way that parking lot was full all the time. Hopefully the food is as good as the look of the joint! The food is decent; typical 50’s burgers with those nasty sour pickles, etc. Some modern things like the “Popeye,” a loaf of bread stuffed with spinach. Basically diner fare. The atmosphere makes it worth going. They have a pink ’58 Belaire out front, but they don’t take very good care of it. Doubt if it runs. Great prop for photos, though. If you want to be bothered occasionally by updates, you can sign up here. Your password has probably been stolen. Here’s what to do about it.